What if I told you that, every day, each of us carries around a constant stressor that might be holding us back from healing? Electromagnetic frequencies (or EMFs) are all around us. We all carry an emitter -our cellphones- but they also come from microwaves, computers, Wi-Fi, Bluetooth, and smart meters. Pretty much anything that can plug into an outlet will create interference, some more than others, but most of it comes from Wi-Fi. Cell phone towers are going up every day, and cell phone companies pay for real estate on buildings like churches. These towers then affect everyone within a mile. EMFs aren’t supernatural mumbo-jumbo. 5G networks are coming on the market right now, and they use millimeter waves- being exposed to them is like hanging out in the x-ray machines the TSA uses. And 6G networks will be a reality someday soon. EMFs have even been found in the middle of rainforests. It’s unbelievable. There’s no escaping exposure. But what do electromagnetic frequencies actually do to us? And do we have any control? The answer is YES… Thankfully, we don’t have to be powerless victims. But before we get into the solutions for EMF protection, let’s define what an EMF actually is. 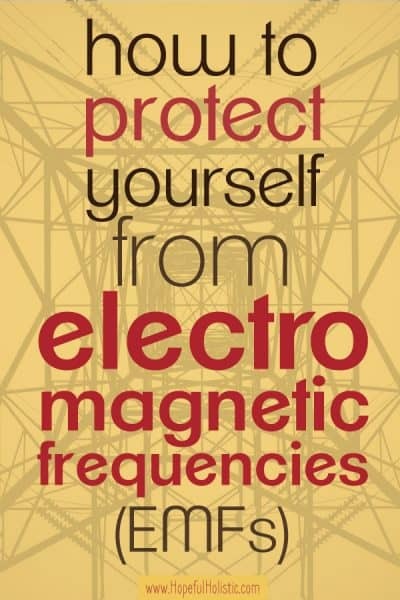 Electromagnetic frequency, or EMF, is a type of radiation. EMFs are also called EMI, or electromagnetic interference, or EMR, electromagnetic radiation. This radiation is found in all technology, from microwaves to radio towers. An EMF’s strength depends on its frequency and wavelength- electronic devices with higher frequencies are more harmful and have greater health risks. So although EMFs naturally occur everywhere in the world, (even humans emit some EMFs) they are harmless because the frequency is weak. Even though EMF in the natural world is safe, they can still be incredibly harmful when they come from technology. So what exactly does this dangerous radiation from electronic devices do to us? What are the health risks of EMFs and how do we protect ourselves? Read on to find out! EMFs can be a constant stressor to our bodies, one that keeps us from healing from the things we’re dealing with, such as chronic illness. Just because you don’t feel it doesn’t mean it’s not affecting you. The fact we can’t really feel EMFs (although you might get a headache from standing too close to a SMART meter, depending on your EMF sensitivity) actually makes them even more dangerous- you aren’t as likely to protect yourself against something you can’t see or feel. Electromagnetic frequencies damage us at a cellular level, and they’re even more harmful to children. But EMF exposure symptoms aren’t always obvious. How exactly does it mess with our health? When you’re exposed to EMFs along with other vectors, the EMFs can amplify their effect. For example, EMFs can make parasites that are normally harmless start damaging your body. EMFs can make good bugs go bad. And when you’re around mold and EMFs at the same time, the mold will release around 600 times more mycotoxins (the toxic off-product of mold) than normal. It also amplifies the toxicity of any heavy metals you have in your body. Beyond that, our cells vibrant at a specific frequency. This frequency works synergetically with other cells that match its energetic properties, and eventually, this forms an organ system, which makes up who we are. We all have our own unique frequency. Now stick with me here- electromagnetic interference works at a frequency that disrupts our cells activity and communication. It decreases the cell’s efficiency at detoxing and gathering nutrients. This happens because the cell loses voltage. Our cells become less functional, and the result is that we can’t get well as easily. Who you are is only 20% physical. You’re also 20% thermal, 20% magnetic, 20% electric (or light) and 20% spiritual (or the mind). The 80% that isn’t physical has a huge impact on the physical 20%, and it’s worth focusing on. In fact, frequencies relay information in our bodies 100 times faster than our body chemistry! The puzzle -of why we get sick, what causes illness, etc- starts to come together when we take the 80% into account. As for the electric 20% of what makes us up, you might have heard a few of its nicknames. This 20% is our biofield, our personal energetic blueprint, a plasma energy field that extends out of us… And we don’t quite understand it yet. What we do know is that, for optimal health, women should have around a 13-foot biofield, and men should have about a 10-foot field. But in today’s toxic environments, we usually have a much smaller biofield- around 1.5 feet. Why does our biofield matter? This energy, our biofield, helps to decide how well our immune system works. With a strong biofield, we’ll be more resilient to EMFs and the bugs in our environment. But when our biofield takes a beating and isn’t as strong as it should be, our weakened internal environment will let more pathogens in. Mold, toxicity, and infections will all be harder to deal with. These are all things we have in our environment, even more so as the use of pesticides and GMOs increase worldwide. We need to have systems that can stand up to the onslaught. Think of the biofield as a force field of light. Each time an EMF hits the force field, it stabs a hole in it. Those holes start bleeding out energy, and the size of the biofield shrinks. As our energy becomes dimmer, the voltage of our cells decrease. Electricity is a by-product of light, and the physics aren’t fully studied or understood yet. What we know right now, though, is that photography (dark-field microscopy, and Kirlian photography) can capture our energetic output. It shows how we are dimming, and that shows in our health. We should make our biofield as big and bright as possible so that we have a higher cell voltage, and an equal increase in our ability to recover from illness. Unfortunately, EMFs can’t just be blocked. There are lots of blockers on the market, however, many of them are insufficient. In fact, your phone will push out a frequency harder if there’s something in the way! This can increase the EMFs that are heading your way. If you’re using any sort of sticker to block EMFs and you notice your phone getting hotter, it might be doing more harm than good. But don’t panic– there are lots of other ways to reduce your exposure to EMFs! First, you can get an EMF meter like this one if you’d like to know the exposure around your house. There are three different types of EMF (magnetic, electric, and microwave) and this EMF meter tests for all three, instead of just testing electrical outlets like some cheaper meters. You can also hire a professional to bring an EMF detector to check your home’s EMF levels. This won’t reduce EMFs, but becoming aware of the problem (in this case, by getting an EMF reader) is the first step towards fixing it. 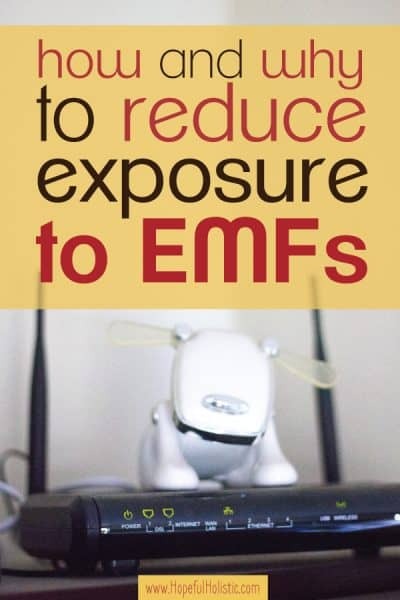 EMFs are invisible, but we shouldn’t be naive about their harmful side effects. Remember that the main goal in all this is to enhance the size of your biofield so that you can be more resilient and healthy in the future. These changes are worth it because your health is worth it! Here are some ways you can easily reduce your EMF exposure and protect yourself from the EMFs around you. For starters, unplug electronics that you aren’t using. Outlets can be “leaky” sources of energy and can release more EMFs if something is plugged in, even if it isn’t turned on. This might seem a little inconvenient at first, but you can move stuff around and make outlets accessible so it takes about two seconds to plug something in before using it. Carrying around a phone that’s constantly emitting radiation through Wi-Fi or 4G can be incredibly harmful over time. If you carry your phone on you, make sure it’s in airplane mode. I know, I know, in our hyper-connected society that’s a hard pill to swallow, but I think you’ll find that not relying on your phone and social connectivity every. single. second of the day is a great thing! If you’re making a phone call, hold your phone at least an inch away from your head, or, better yet, put your phone call on speaker. Don’t use Bluetooth headsets. And for you men– if you’d like to be fertile, don’t carry your phone in your pants pocket. Try to reduce your phone usage overall. And good advice for anyone- if you need your phone on, put it somewhere three feet away from you– eight feet is best to reduce your EMF exposure. If you’re walking around and need to have your phone on you, it’s best if it’s in airplane mode or at least not right by your body. This is especially important at night. Make sure your phone is on airplane mode or move it a few feet away. Or do both! I don’t have my phone near my head anymore, and it’s not the first thing I look at in the morning. And by the way, it’s not just about EMF protection. Did you know that looking at your phone immediately when you wake up can negatively impact your mood for the entire day? True story. It’s healthy in more ways than one to not be leashed to our phones. Wi-fi interferes with your cells’ communication with each other. Constant exposure is incredibly harmful in the long run. Did you know that bees will leave a hive if it has Wi-Fi nearby? Can’t be good for us. To reduce your exposure, turn off your Wi-Fi at night. You can use an inexpensive timer like this one so that you don’t even have to think about it! Keep Wi-Fi turned off on kids’ phones, and try to use it as little as possible yourself. This tip can also help you sleep better at night! You can also turn off the Wi-Fi and connect your computer directly to the network using an ethernet cable. This is a good choice especially if you have to work on the computer all day- with a cabled connection, you won’t have Wi-Fi exposure right by your head and workspace all day long. This is an easy fix to quickly reduce your EMF exposure. I use an ethernet cable like this one. It’s super cheap and long enough to move my computer to where I want it! If your computer is plugged in with an ethernet cable, turn it on airplane mode too! Even when there’s a cabled connection, there’s still electromagnetic radiation from Wi-Fi unless it’s turned off. You can hardwire in speakers and other technology too. If you haven’t heard of grounding (or earthing), that’s when you are in direct contact with the earth. This releases extra electrons and helps reduce free radicals, which increase with EMF exposure. If you’re like me and have to be inside for a big chunk of the day, you can also use a grounding pad. This is just a flat mat that you put under your feet, and it plugs into the grounding portion of an outlet so that you can ground from indoors. I use this one under my desk all day errday! Unless you want to be a human conductor -and not the kind that drives trains- you should try to limit the metal you’re wearing on your body. Underwires in bras, metal jewelry, and piercings can all act like antennas on your body’s electromagnetic field. It’s best to try to reduce the amount of metal on your clothes, jewelry, and accessories as much as possible to increase your EMF protection! Artificial blue light is a form of electromagnetic frequency, and it’s emitted from screens -phones, TVs, tablets, and computers. To protect your biofield, you should reduce your exposure to EMFs that come from blue light, especially after it starts getting dark. How blue light works is that it when it goes in your eye, it goes straight to the pineal gland (which is right in the middle of your brain) and decreases its function. The main function of the pineal gland is melatonin production. Melatonin is a major antioxidant in the body, and its production is inversely related to health issues. Melatonin is well-known as a hormone that helps you sleep, but decreased melatonin is a much bigger issue than just affecting sleep. Your melatonin is inversely related to cancer cell activity. Less melatonin increases your risk of cancer, and also makes it harder for your body to enter a deep para-sympathetic stage while sleeping. In general, it’s tougher for your body to recharge and heal. So- reducing blue light is important! Here’s how. First, there are simple (free!) apps you can download on your computer (f.lux) and phone (Night Shift for iPhone or Blue Light Filter – Night Mode for Android) that will decrease your screen’s blue light when it gets dark out. A better option is to avoid screens completely when it’s bedtime- this can be hard at first, especially if you’ve made it a habit to check your phone before bed, but I promise it gets easier! If you do want to watch a movie or you’re exposed to screens a lot, even throughout the day, there are blue light glasses that you can wear to reduce blue light exposure. I try to wear these ones any time I watch a movie at night or when I’m looking at a computer all day. They fit over my normal glasses just fine too! It’s hard to completely eliminate blue light at night. Just make good decisions to keep yourself moving in the right direction! Try to use fewer CFL light bulbs in your home. These put out EMFs and also emit mercury when you first use them! You can replace bad light bulbs with incandescent bulbs. The next best choice is LEDs, but they can be a little more pricey, and some are better than others at reducing EMFs. You can test your bulbs with an EMF meter to see how they measure up. Or better yet, use candles at night! Your brain is used to the spectrum of light coming from candles, and candlelight isn’t too bright. Even incandescent bulbs can mess with your melatonin production if they’re too bright. Make sure you choose candles that have lead-free wicks and are non-toxic. 100% beeswax candles with cotton wicks are a good option. I like these taper candles and these tea light candles! Remember how EMF blockers can do more harm than good? If you’re using blockers for EMF protection, you might want to replace them with EMF shields. Instead of trying to block the EMF output and forcing your device to push out more signals, an EMF shielding device works to change the vibrational output so that the electromagnetic frequencies aren’t as harmful to your cells. So what’s the best way to protect yourself from EMF radiation? I highly recommend Aires Tech for this important job. They’re independently verified and have patented their technology- the result of $20M put into research and development. Yep. They know their stuff! I trust Aires Tech products wholeheartedly. How do I know they work? Well, other than feeling better when I’m wearing my Aires EMF shield, I also took it to my naturopathic doctor. He was able to verify that my body wanted the EMF protection that these shields offer. They really work- it’s not a placebo! There are a couple different options for EMF protection for you and your home. You can get a body shield- the Aires Defender Pro, which you just put in your pocket and carry around for personal EMF protection. There’s also the Shield Pro, which can be used on your phone, computer, or Wi-Fi. They also offer the super-powerful Aires Guardian, which can be used to protect entire rooms. And guess what? I’ve got a discount code for you! Use code “hopeful10” for 10% off your purchase! This code can also be used on top of their sales, which they offer regularly! Lastly, the SMART meters we have in the yard are a huge source of electromagnetic interference. You can check with your city or power company to see if you have a SMART meter installed, and if so, the city might be able to help you get it replaced. You can let them know that you have health issues related to the meter, but it might cost to get it replaced with an analog meter. Another option is to cover your SMART meter with an EMF guard, to help shield against EMF radiation. You’ll need an EMF meter for this job as well, to make sure that the guard is working to reduce radiation levels. Think you’re going to try some of these? Do as much as you can for yourself and your health by building up these methods of EMF protection. This will give your biofield the best chance it can get to increase. The thing I love about decreasing exposure to the electromagnetic radiation all around us is that you get to pursue health in so many different areas at the same time! You’ll learn to be less attached to your phone and more in tune with your surroundings. You can get outside more and ground yourself for stress relief and self-care. You will increase your immunity to the toxins that are all around us. For more on decreasing your exposure to toxins, you can get my free guide to reducing toxins here! This is all part of living holistically, or looking at the whole person, not just the symptoms in the 20% of us that is the physical part. I hope that this part of your health journey is a joy to you, and that you experience healing and thriving in every area of your life! Interested in learning more about your energy? There’s a lot of interesting information out there about our energetic biofield and aura. One of the most fascinating tools I’ve found in my journey towards holistic living is something called human design- it’s a revolutionary personality tool that teaches you about your unique energy blueprint. Human design is a synthesis of eastern and western astrology, the Judaic Kabbalah, the Hindu Chakra system, the Chinese I’Ching, and quantum physics. It can help you learn about how you absorb and use energy, how you produce energy, how to sleep better, how to make decisions, how to better align with your authentic self- and much much more! To learn more about human design, check out this post: what is human design? You can also get your FREE human design chart to start learning more about yourself at an energetic level.